I love this homemade lemon sponge cake recipe from scratch. It's heaven on a fork actually. Have all of your ingredients sifted, measured and ready to go before you begin to make this cake. When the yolks are warm to touch, pour the remaining 1/2 cup sugar to the egg yolks and beat with a mixer until thick and light yellow in color. (When you lift the beaters it should resemble a ribbon) Now gently fold this egg yolk mixture and the lemon extract and zest into the egg whites and sugar. 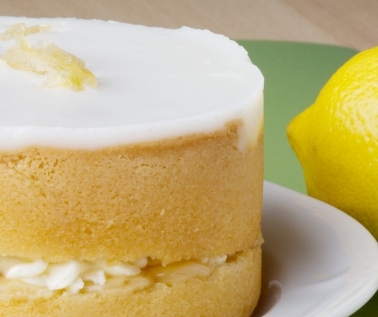 To go along with my lemon sponge cake recipe is this easy and delicious lemon glaze. Mix ingredients well and pour over warm sponge cake. Recipes adapted from "Baking, From My Home to Yours" by Dorie Greenspan. She is an outstanding baker. Pick up the book - you won't be sorry.